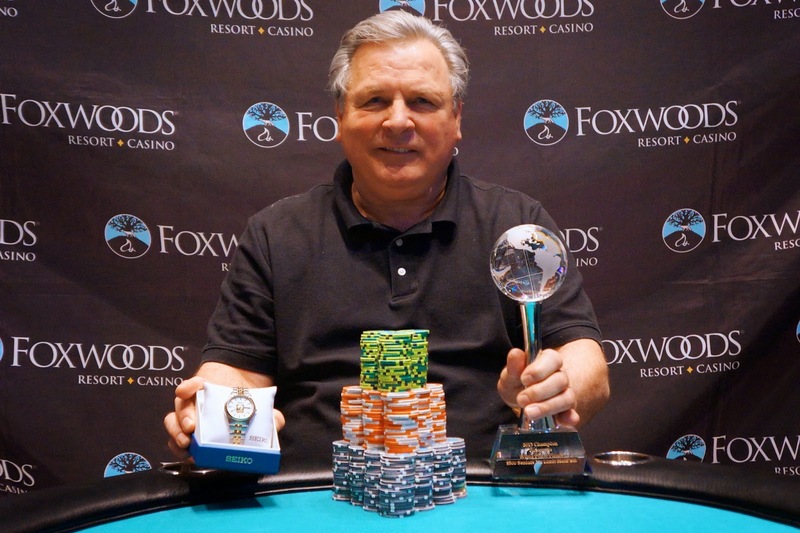 Lou Cardillo Wins the $500 No-Limit Hold 'em Seniors Event! Congratulations to Lou Cardillo, winner of the $500 No-Limit Hold 'em Seniors event at the 2013 Foxwoods World Poker Finals. 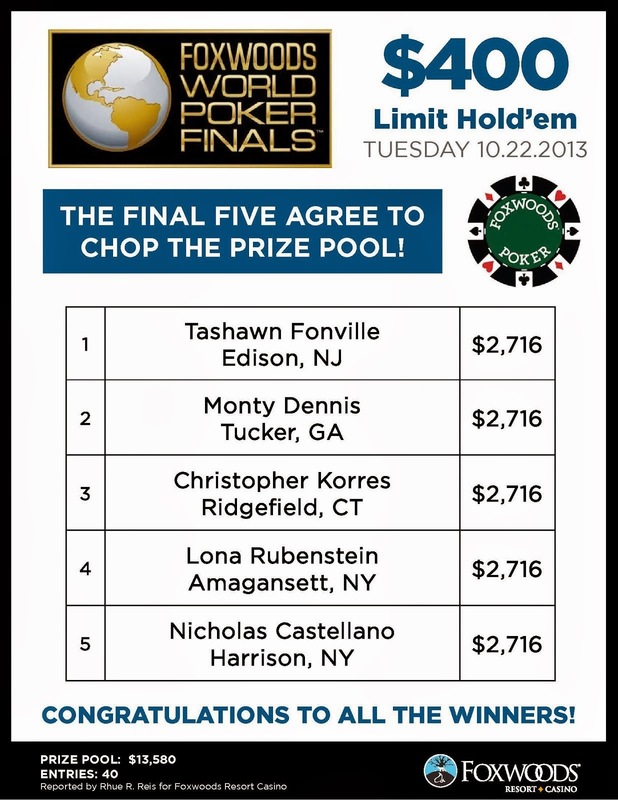 A deal was struck four-handed with money left on the table to play for. 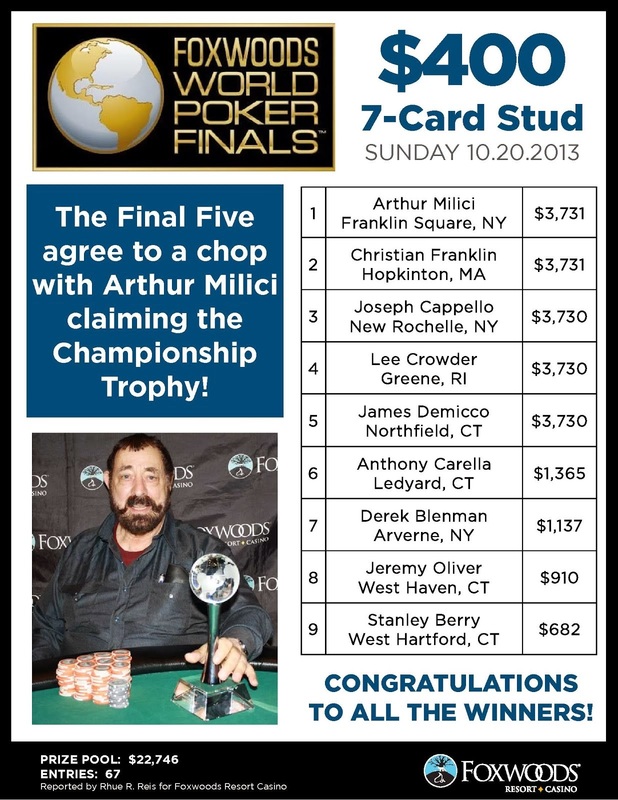 Cardillo ended up taking the trophy along with $16,147 and the World Poker Finals watch. Flight A of the $300 No-Limit Hold 'em with Re-Entry event has come to an end. 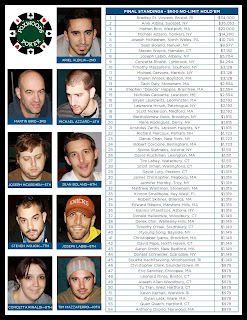 A total of 42 players advanced from the first session with Flight B currently in Level 5. 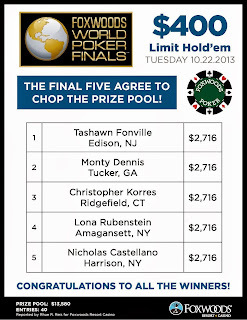 Full chip counts, Day 2 seat assignments and payouts will be announced at the conclusion of Flight B, later tonight. Day 2 will resume at noon on Friday. 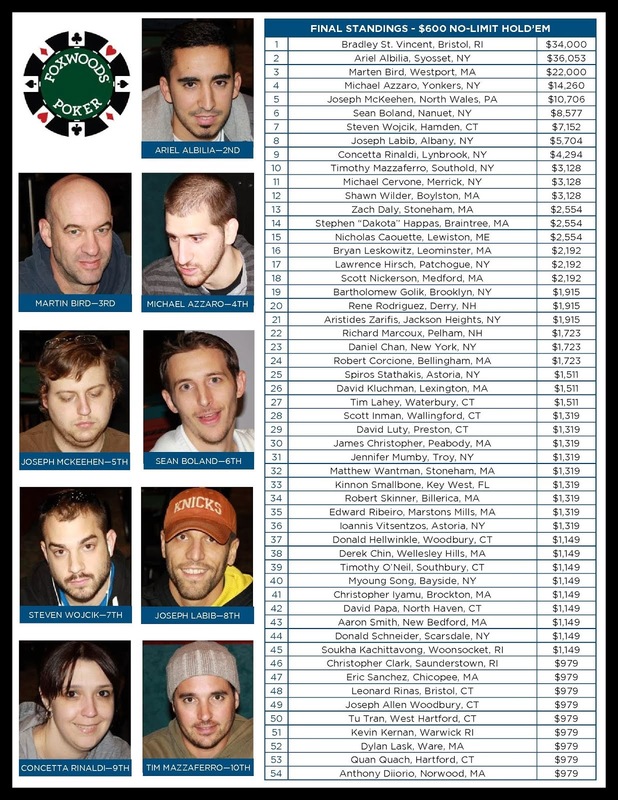 Vincent Moscati Wins the $400 Pot-Limit Omaha High Event! 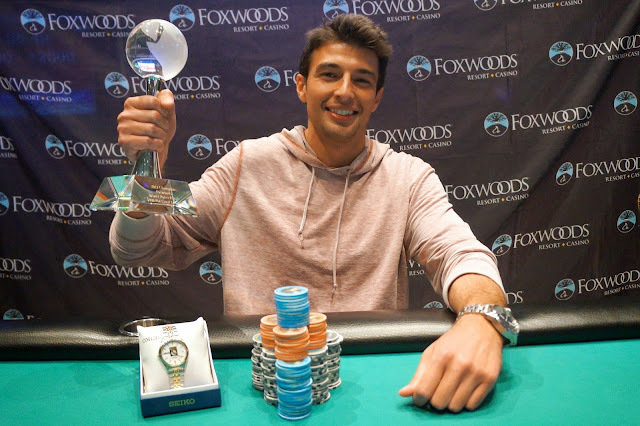 Congratulations to Vincent Moscati, winner of Event 7, the $400 Pot-Limit Omaha High, at the Foxwoods World Poker Finals. 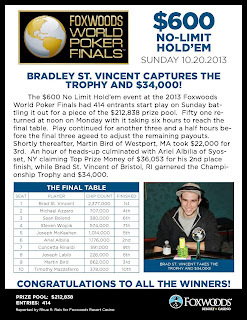 Vincent takes home $7,639, the World Poker Finals trophy and the watch for his victory. We have reached the final table in the $500 No-Limit Hold 'em Seniors Event #6 at the Foxwoods World Poker Finals. 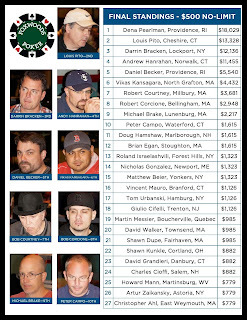 Louis Cardillo current leads the field with 831,000. Blinds are currently 5,000-10,000 with a 1,000 ante. 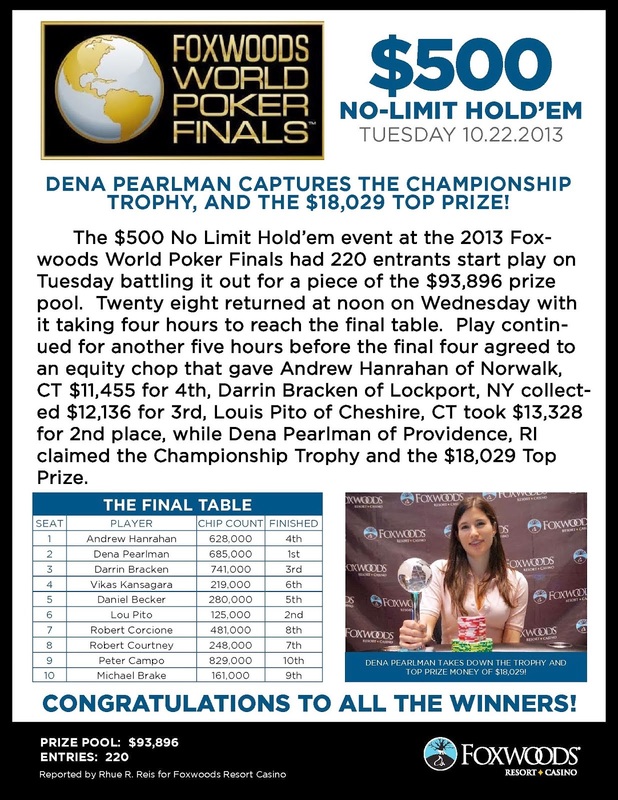 Registration has closed for Flight A of the $300 No-Limit Hold 'em Re-Entry Event 8. The final number for the first flight is 262 entrants. Flight B gets underway at 5pm this afternoon. The two fields will combine to form Day 2 that will kick off at noon on Friday. 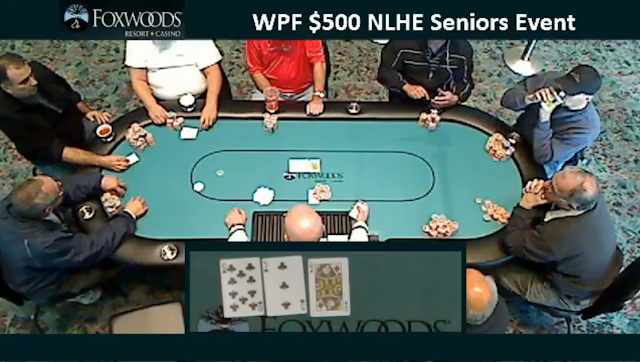 Day 2 of the $500 NLHE Seniors Event Underway and Streaming Live! Day 2 of the $500 No-Limit Hold 'em Seniors event has resumed at the 2013 Foxwoods World Poker Finals. There are currently 18 players remaining and all players are in the money. Flight A of the $300 NLHE Re-Entry is Underway! 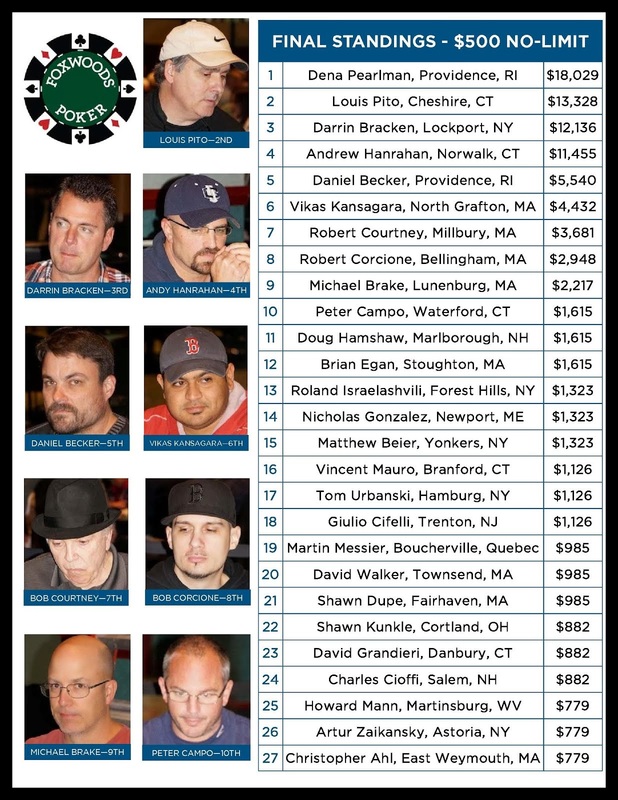 Flight A of Event 8, the $300 No-Limit Hold 'em Re-Entry, is now underway. 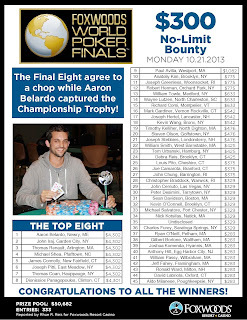 Players start with 15,000 in chips and all levels are 30 minutes in length. 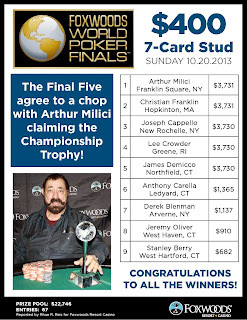 Registration and re-entry will remain open through the end of Level 6. There are already over 200 entrants in Flight A. Flight B will kick off at 5pm. Both flights are scheduled to play 15 levels today. The Flight A and Flight B fields will combine tomorrow at noon for Day 2.